In July of 2009 Deb and Mark were in the middle of an adoption journey. The couple was searching online when they discovered a short biography that caught their attention, “four year-old delightful girl, pleasant disposition, clubfoot.” After contacting the adoption agency, Deb and Mark received more details. The description of Rasika (the little girl in the bio) failed to explain the clubbed foot was on a leg that did not grow. In 2009 Rasika was six years old. She was being well cared for in the Indian orphanage, but had spent her entire life hopping from place to place on her left foot. Many families in the United States shy away from adopting Indian children because the process is long and complicated. But in 2012, the three years of navigating international adoption red tape were well worth it when Mark and Deb pulled up in front of the orphanage. Rasika was in the doorway, jumping up and down with joy. Her bright disposition was evident even from a distance as Deb and Mark approached the building. “Rasika didn’t hesitate, she just threw her arms around me the moment I met her on the stairs. She didn’t have any issues attaching to our family,” says Deb. While the five flights home were far from uneventful (let’s just say they involved some airsickness and a change of clothes), the family landed in Cincinnati on April 13, 2012 excited about what was ahead for Rasika. Within the first few weeks Deb and Mark were at Cincinnati Children’s’ Hospital getting their new daughter the care she needed. There were vaccines to update, common ailments to treat, and the family finally saw an X-Ray of Rasika’s leg. The extent of her disability became more clear when the films were presented. 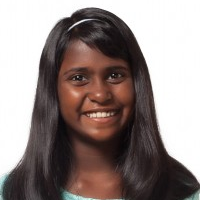 Rasika only has a fibula; no patella, no tibia, and she may be missing some bones in her foot. She has a formal diagnosis of tibial hemileia. Deb began to search for a long-term solution for her daughter. She explored other options, and in the end, it looked like Rasika’s best course of treatment would be amputation. The surgery was scheduled for January 24, 2013. Just weeks before the procedure, one of Deb’s friends suggested that she contact Rob at SPS prior to the operation. That made sense to Deb–she wanted to feel confident in the team that would be caring for Rasika for years to come. Rasika’s family decided that the best course of action was to postpone surgery until they could meet with Dr. Jan Ertl in Indianapolis. A few weeks later, Mark, Deb and Rasika had their first consultation at Dr. Ertl’s office. “Rob came with us to the consult. It provided a great amount of comfort to have him right there with us. I was so thrilled that he was there,” says Deb. Dr. Ertl imagined producing an even larger end weight bearing area over a traditional knee disarticulation by keeping her current pseudo knee (the relationship of distal femur, fibula and surrounding soft tissue) intact and envelope her fibula and surrounding lower limb anatomy in a flexed position so it would surgically be fused laterally to her femur. This plan would offer less surgical intervention to the end of her limb. It would also eliminate chances of painful distal neuroma formation, help to maintain natural balance of her muscles, and produce a fuller residual limb as she grew. This option was creative and sounded like a huge advantage over a traditional knee disarticulation or prosthetic foot. Having Rob at the consultation made the communication between the entire team easy, collaborative and sped up decisions considerably. Rob set out to craft something that could give everyone peace of mind moving forward. Within two weeks Rasika was back at SPS trying on a “practice leg” for the first time. The results were outstanding. The details of watching Rasika in that moment are etched into Deb’s memory, “She was in a practice prosthesis, and took her very first steps. Our hearts were beating so fast–out of our chests. Rasika just kept looking in the mirror, fixing her hair.” It was a sweet reminder that despite her physical limits, Rasika is a true nine-year-old girl. The practice leg proved that her leg bones could bear the weight they needed to (just like Rob and Dr. Ertl hoped it would). Rasika’s surgery is coming up, and the whole team is looking forward to caring for her in the years ahead. Check back here for updates as Rasika realizes some incredibly fun goals.